We relocated our rehearsal venue to Mortimer in 2013 and have been thrilled to provide a few of our musicians to play at the Fun Day each year since 2014, the Silver Sunday event in October 2014, and to support the singing at the Christmas Carols organised by ﻿TiM﻿ each year. For the first 2 years, our regular rehearsal venue was at Mortimer St. John's Infant School with the occasional rehearsal next door in St. John’s Church. However, in September 2016 we moved to Mortimer Methodist Church for our regular Friday evening rehearsals. Our biggest challenge is finding a place large enough for us to perform in and still have space for an audience. Working with Mortimer Village Partnership helped us to create an opportunity for us to perform in the village for the first time on 5th July 2015. Making the most of the marquee tent still on the Fairground from the Fun Day meant we had the perfect venue for our "Music for a Family Picnic" event. We were pleased to welcome many of the local people to join us and the children from Mortimer St John's Infant School for an afternoon of music. We returned there for our second marquee Mortimer concert "Community Celebrations" in 2016, continued in 2017 with "Heroes and Villains", and then in 2018 with "Stage and Screen". See our pictures of the events in our Gallery 2016, 2017 and 2018 pages. We also played in Mortimer in 2016 during the Queen's Birthday celebrations. Our first indoor concert in Mortimer was in St John's Church on 15th October 2016. See our Concert 2016 page for more details. 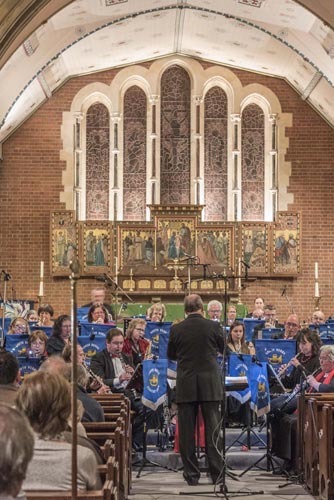 We returned to St John's Church for our Winter Concerts in December 2017 and 2018. Our next concert will also be at St John's on 23rd March 2019. Some members can be seen enjoying a drink in the local pub, The Horse and Groom, after our rehearsals on a Friday evening. We are a friendly group, so if you see us there, please say hello!